Heparin is a blood thinner used as part of the chemotherapy infusion process. It is often used with people receiving chemotherapy for breast cancer because research indicates that chemotherapy increases the risk of blood clots. Since Heparin is an anticoagulant it is used to prevent blood clots in your port catheter line. One of the most common "side effects" of a chemotherapy port is clotting, and it's thought that heparin may reduce this risk. At the beginning or the end of your chemotherapy infusion, your nurse will inject a vial of heparin into your catheter line to flush it. 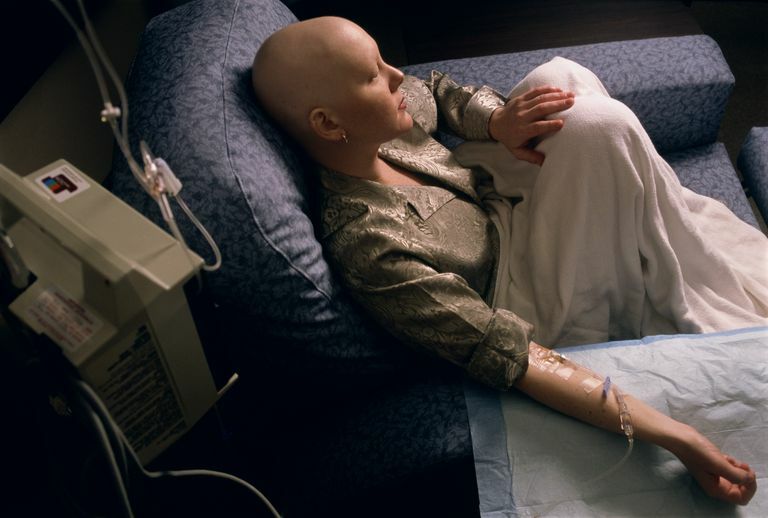 Chemotherapy infusions involve a lot of tiny tubes (catheters) through which drugs, saline, and blood may travel. If you have an under-the-skin port for chemotherapy, you will have a catheter line attached to the port, which carries the infusion liquids to your heart, where the drugs mix with a tremendous volume of blood and then flow throughout your body. It prevents your chemotherapy nurse from being able to do your CBC blood draw, as well as your chemotherapy infusion. Blood flow is blocked and may cause pain or swelling in your face, neck, chest, or arm. The tube may break or leak, requiring a repair or replacement. A typical post-chemo heparin flush is 5 cc, a very small amount, and is unlikely to cause discomfort or side effects. Avoid this drug if you are allergic to heparin, beef, pork, or any of the ingredients in a heparin injection. Check with your doctor to be sure heparin will not negatively or interact with any of your other medications. If your platelets (cells that help blood clot) are low, your doctor may recommend a saline flush instead. Stop smoking if you have regular heparin injections, as smoking can make heparin less effective. In addition to a post-chemotherapy flush, heparin is used to treat blood clots in the legs and lungs. It is also used to prevent blood clots after surgery. People who are unable to move for a long period of time may need heparin to prevent deep vein thrombosis (a blood clot that forms in a vein deep inside the leg or thigh). These blood clots may break off and travel to the lungs (pulmonary emboli) sometimes with catastrophic results. People with cancer have an increased risk of developing blood clots, even without chemotherapy. Heparin may be used in appropriate doses for all ages, from newborns to elderly people. Being your own advocate is important in every phase of treatment. Advocacy includes asking about your treatment medications, side effects, and precautions before an infusion. It also includes educating about your medications, possible interactions with other drugs, and what symptoms should prompt you to call your doctor. Being as comfortable as you can be during what may be a few hour chemo infusion process begins with choosing the right infusion site prior to starting treatment. Make sure to talk to your doctor about the advantages and disadvantages of different methods such as a traditional IV (placed each time you have an infusion), a PICC line, or a port (port-a-cath). Most cancer centers and many freestanding chemotherapy centers have individual cubicles that give people privacy during an infusion if they would like. These are especially nice for longer infusions (such as with Taxol (paclitaxel) in that you can lie down and take a nap. This arrangement also lends itself to feeling free to share concerns, ask questions about the medications you are receiving, and share physical responses to your treatment with your nurse as she comes in and out to check on you. There is also room for someone to keep you company during treatment. Some people, however, prefer the chemotherapy chairs, and the opportunity to both see and converse with other people receiving chemotherapy at the same time. These large open areas are often light and airy as well, whereas a cubicle may not have windows. The important thing is to know you have a choice and to voice your preferences with your oncologist and infusion nurse. U.S. National Library of Medicine. Heparin Injection. Updated 12/21/17. What Is a Port and Can My Blood Be Drawn Through It?